How far had the British Army changed in the century since Waterloo? David Porter argues that the British military was far readier to embrace new technology than caricatures of crusty colonels imply. MHM Editor Neil Faulkner analyses the Kaiser’s Germany as Europe finds itself on the brink of war. Nigel Jones considers the dilemmas facing American soldiers torn apart by civil war in 1861, and how their choices shaped the fate of the nation. Stephen Roberts assesses the military achievements of Henry Bolingbroke, the rebel leader and founder of a dynasty that inspired Shakespeare’s plays and culminated in the Wars of the Roses. Patrick Mercer studies the hideous fighting on the Gustav Line between January and May 1944, and the controversial destruction of the famous monastery. Also in this issue: War on Film, Recommended Read, Behind the Image, Book Reviews, War Culture, DVD Review, Thinkers at War, Back to the Drawing Board, Museum Review, and much more. Was the British Army in 1914 just a class-ridden colonial anachronism, or was it a modern, high-tech fighting force? Probably a bit of both. 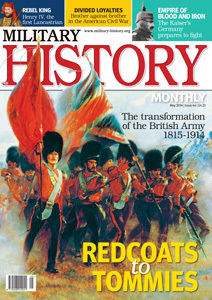 But we focus in this issue on just how up-to-date Britain’s small professional army was at the outbreak of the First World War. The Army was, finds David Porter in our cover feature ‘Redcoats to Tommies’, both technologically advanced and tactically sophisticated. The French and Germans – with their mass conscript armies – tended to launch frontal attacks in dense formations. This is why the French lost a quarter of their men in the first month of the war. British commanders, with a small army of highly trained – and therefore highly valuable – regulars, were much more cautious about casualties. They favoured defensive fighting, by skilled marksmen, and when they attacked they adopted the loosest of formations. The Germans watching the British attack at the Aisne were astounded by the open order. Also on a First World War theme, and continuing our series on the Great Powers, we have an analysis of Imperial Germany on the eve of war. Patrick Mercer continues his series on Cassino, Stephen Roberts returns with a study of Henry IV’s military achievements, and Nigel Jones also writes for us again, this time exploring the strange mix of loyalty and division that afflicted America’s small West Point officer corps with the outbreak of the Civil War in 1861.